PLUS! 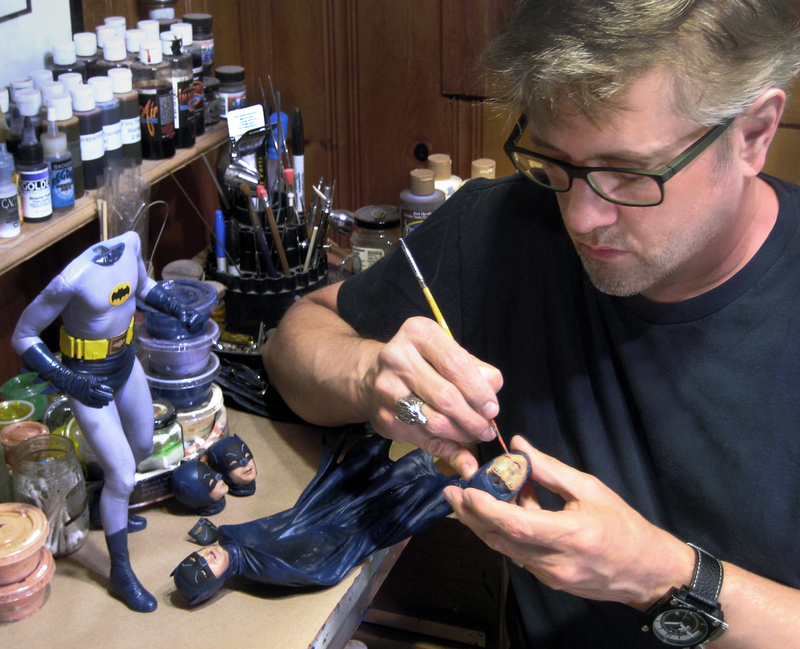 A look behind the scenes with the creators of the Batman masterpiece! We’ve seen Catwoman and Batman. 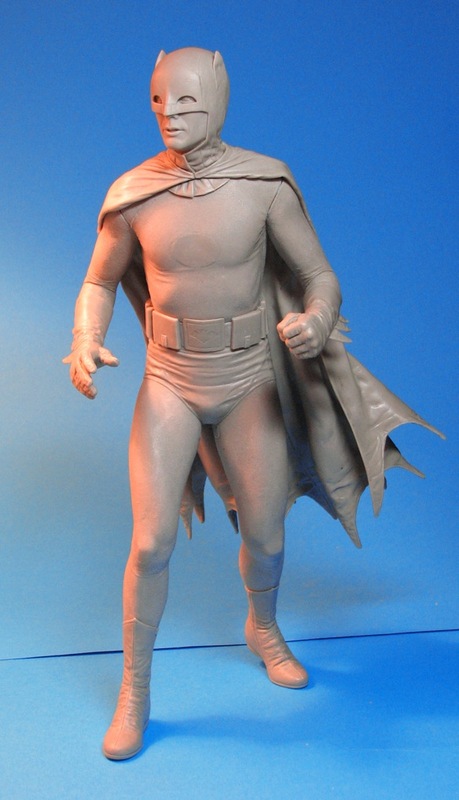 Now, the fine folks at California-based Tweeterhead announce that the next figure in their Batman ’66 line of amazingly detailed maquettes will indeed be the Boy Wonder himself! Robin’s been planned, obviously. But his release has been moved up so the Dynamic Duo will get together that much sooner! Last month, we took you deep into Gotham’s catacombs to bring you a two-parter (in the spirit of the old show, of course) behind the Julie Newmar Catwoman maquette. Here, we bring you a BATMAN’S HOT-LINE multi-MIGHTY Q&A with Colebank, as well as sculptor Trevor Grove and painter David Fisher. 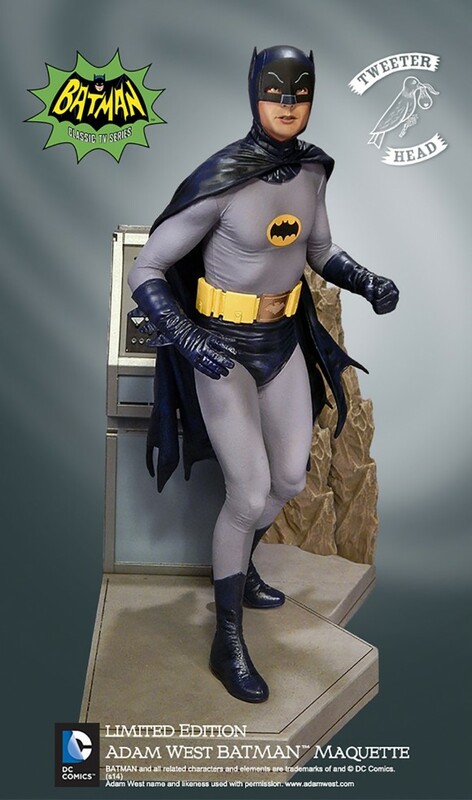 Then, tomorrow in Part 2, we’ll talk to Batman costume expert Chuck Williams, who was involved in getting the details of this maquette just right. 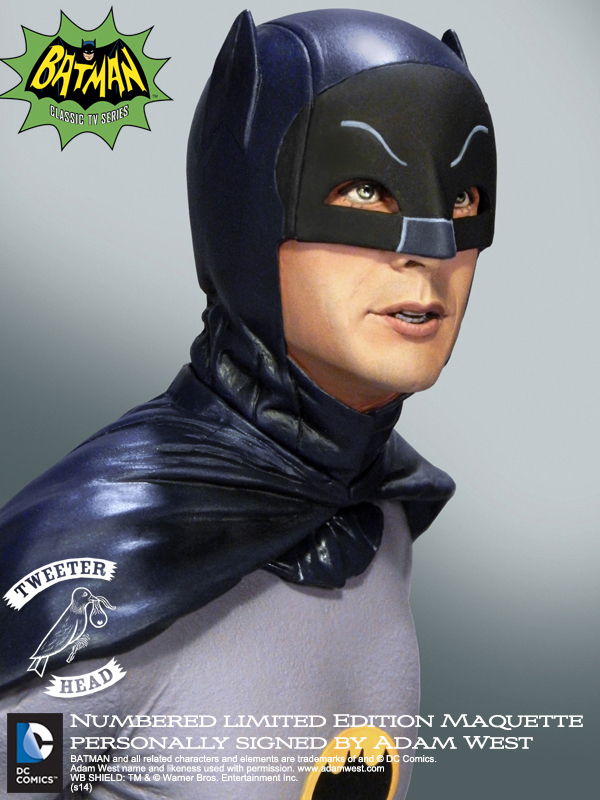 Oh, and today we also have an EXCLUSIVE announcement on something new and Bat-tastic that Tweeterhead has planned beyond the ’66 line! Dan Greenfield: How did you get Adam West involved? Chad Colebank: Adam wasn’t too involved in the initial concept, although he did officially approve everything. We based our pose initially on a photograph that we knew Adam liked and then tweaked it from there. 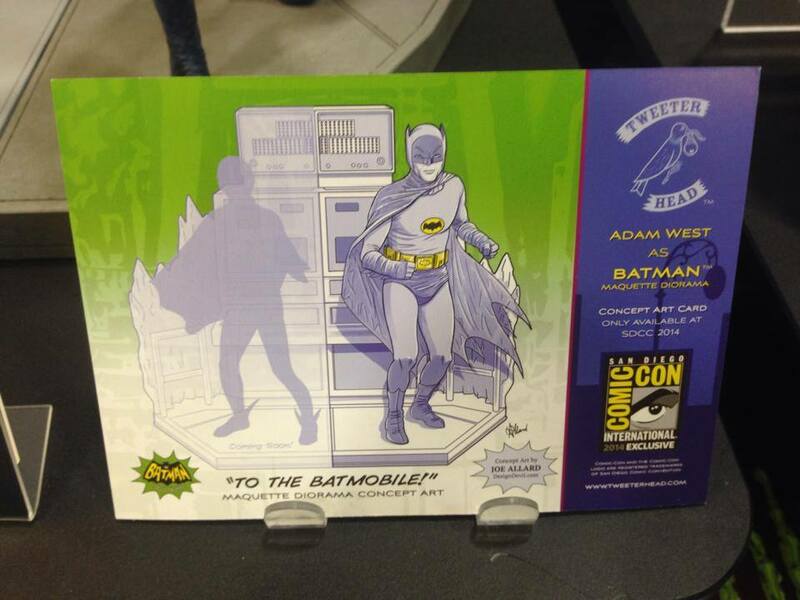 I had a good idea of what I wanted to see and knowing that Adam would be appearing at our booth at SDCC to reveal the piece to the public for the first time made making this as perfect as we could a must. I think all involved knew kind of what we wanted to do … so this one was pretty easy. The biggest problem for me was deciding what scene to put him in. I have to give credit to our concept artist Joe Allard for the Batcave idea. I wasn’t 100 percent on board with the idea until we talked about adding the Batcomputer and some Cave elements. The Batcomputer is basically a character in itself so it all seemed to come together nicely. Describe what went into accurately conveying his likeness. The likeness, between the sculpt and paint master is all due to Trevor Grove and David Fisher. I can’t take credit for any of it. We did work with Chuck Williams on the accuracy of the costume and another expert, Scott Sebring, was an enormous help too. Chuck knows that suit inside and out and was so helpful when it came to the many details like the boot zippers and the shape they were in and the snaps on the cape, etc. Details like the back fin on the glove being a tiny bit shorter than the front fin is something we wouldn’t have easily caught. Trevor even captured the vents area in the tights…this thing is packed with details! 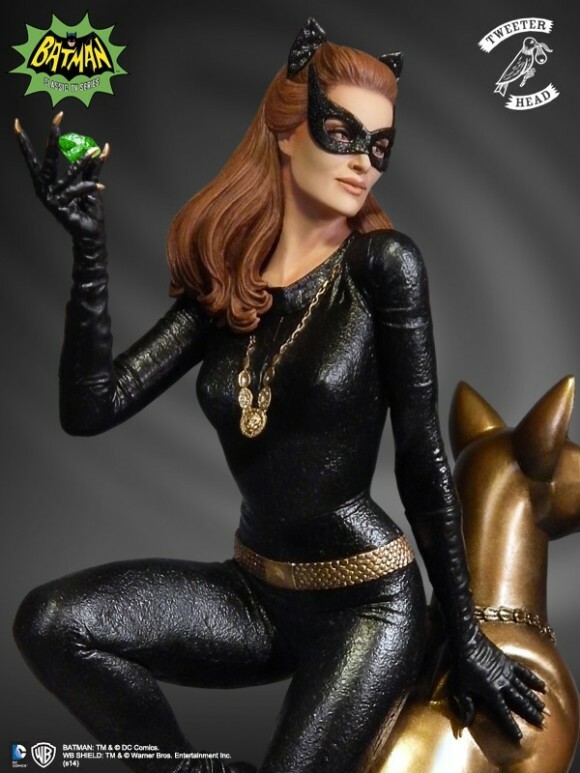 Will the price be similar to the Catwoman maquette? Any special editions? The price will be a bit more (around $300) because of the size of the computer but not much! 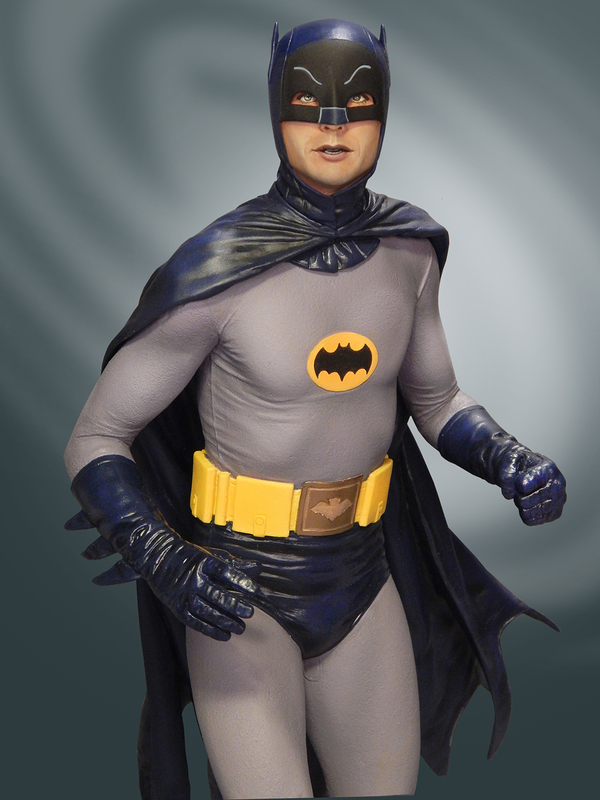 As far as exclusives, Tweeterhead.com is selling our Numbered Edition Adam West Signature Series Maquette. It’s the same plan as our Emerald Edition Catwoman Maquette in that it comes with a certificate that Adam is autographing. When will people be able to start ordering? 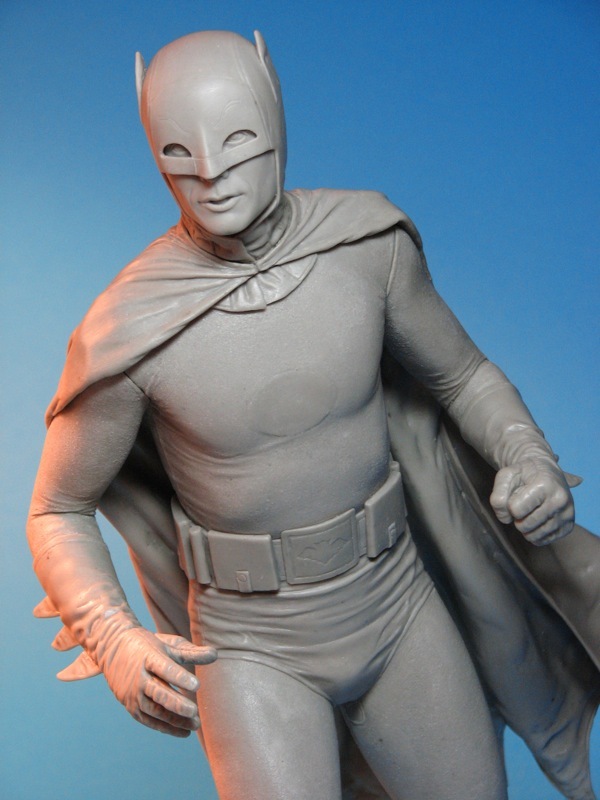 The Adam West Signature Series Maquette is available now until Sept. 15t. The regular edition that doesn’t include an autographed certificate will be going on sale (today) on Aug. 21. Dan: What were the challenges in accurately portraying Adam West, from his costume to his body type? Trevor Grove: I felt a great responsibility to be careful with the details of this piece. Adam’s Batman is an undeniable classic and it’s really stood on its own for generations; I think it can seem deceptively simple because of the light-hearted quality of Batman ’66. I have to say, if it wasn’t for Chad enlisting the help of Chuck Williams, our piece wouldn’t be nearly where it is now. Chuck was very gracious with his knowledge and reference and helped so much. Left to my own observations, I would have made many mistakes. The body was certainly just as important in giving the piece the right vibe too. He had to feel like there was a potential that he could move the way Adam would on the show, because that is most certainly as important as the costume itself in getting the piece to feel like … Pure …West. You obviously took a lot of care with the Batcomputer diorama. Tell us how you guys came up with that. I love the Batcomputer diorama with this piece and I think it makes the entire thing come to life. I can’t take any credit for the success of that, I’m afraid! Joe Allard worked that into the design and Chad was able to get Matthew Black to make the computer and Mike Cusanelli to make the Batcave base. Every collectible you see is a collaboration in some capacity, and these pieces are a great example of the pieces all coming together to form a very cohesive and singular vision. 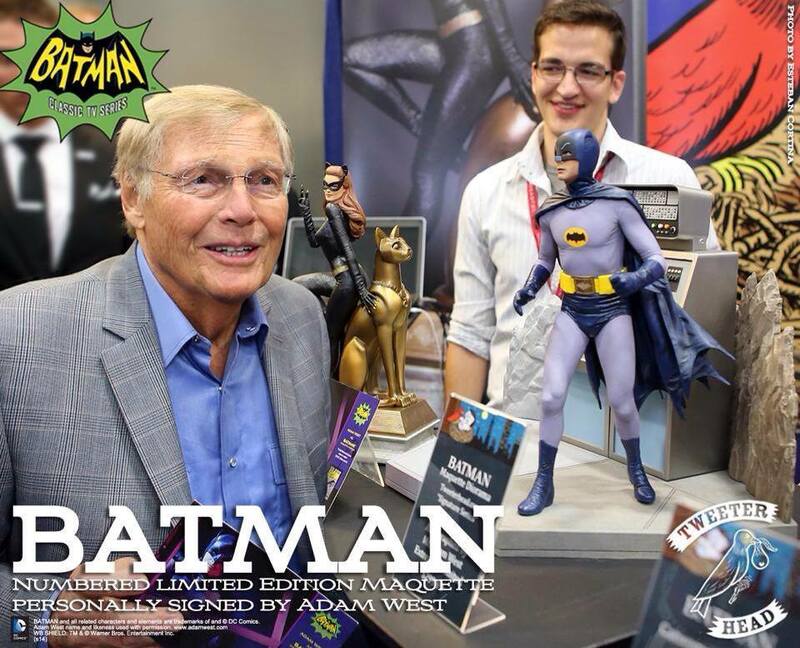 Have you had a chance to meet Adam West? I did! In fact, just in July at San Diego Comic-Con. Chad graciously invited me to be part of our unveiling of the maquette. It was a thrill, and a creative gratification that I’ll always cherish. A sculptor really just wants to honor their subject and make something faithful for everyone that loves the character to enjoy. However, when you can have an opportunity to meet your subject and get such a genuine reaction of appreciation, it leaves an indelible mark on you. It’s a very lovely thing. Our experiences with Adam and Julie on these maquettes have been so great. Dan: How did you get involved in all this? David Fisher: I’ve known Chad for a long time and have done paint commission work for him off and on for probably close to 20 years. When he decided to produce kits and statues, he contacted me to see if I was interested in doing the prototype paint-ups and packaging. Of course I jumped at the chance. Knowing Chad as I do, I knew he’d strive to produce something creative and original, and I wanted to be a part of it. Batman ’66 fans can be a finicky bunch. Color accuracy is very important — from the right shade of blue to the proper reflectiveness of the cape. What did you do to ensure the accuracy? That’s a good question. As a figure painter, I strive to be as accurate as possible. Looking for reference online is a crapshoot, as there are tons of images, but so many have discolored with age so getting an accurate read on them is pure guesswork. That’s where Batman expert Chuck Williams was an integral part of the equation and provided tips and advice, including Pantone color reference for each part of Adam’s costume. I was surprised by some of the information. I did not realize that Adam’s tights are actually a lavender color and not a gray, and that the yellow of his utility belt is a different shade than the emblem on his chest. It’s that sort of detail that I think makes this project stand out from any other Batman ’66 merchandise. We also got a definitive answer from Adam himself regarding the color of his eyes, (green) so I had to get that one right! After matching all of the colors, I had to get the various “sheens” correct to mimic the satin finishes of the gloves and cape, which I achieved with various lacquer coatings. Of all the characters, who were you most eager to do? Well, I’d have to say I’ve already done it, or should I say her … Catwoman is my favorite character, and working on that statue was a pleasure. Then I’d say Batman, with the Joker coming up a close second to him. I actually can’t wait to paint the Joker, he’s going to be a blast to work on. 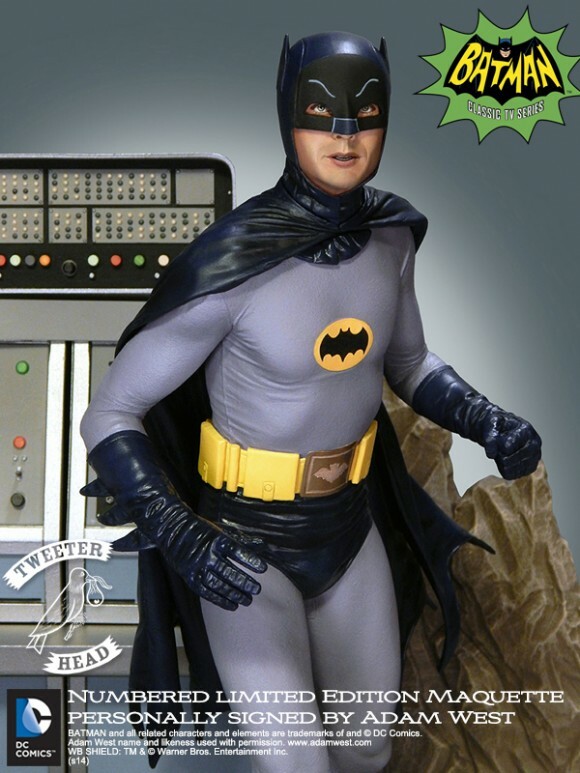 What’s your favorite Batman ’66 episode? I’m old enough to have gone through the original “Batmania,” but I hadn’t seen many of the shows since their initial run. Working on this project, I had almost a full series of DVD disks to view, and while I can’t pick an absolute favorite, I’d say any episode with Julie Newmar would be my choice. She and Adam had great chemistry, and she was just fantastic on the show — come on, who doesn’t love Julie Newmar?